As a health nut, I am currently obsessed with the current smoothie bowl trend! I love going to smoothie bowl cafes and trying out wonderful creations, but I had yet to experiment with them at home. 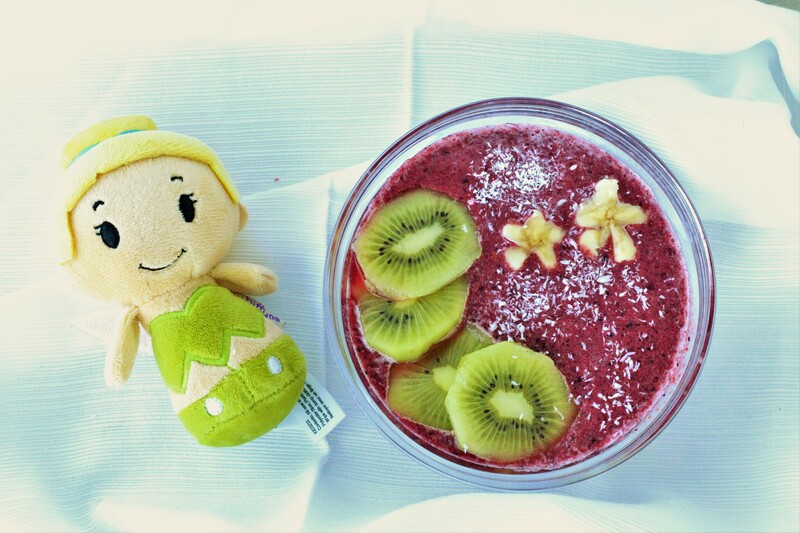 Since I love smoothie bowls, I wanted to make my first homemade one really special, and of course Disney-themed! Having recently watched Peter Pan with my daughter, and seeing the joy on her face during the scene where Peter, Wendy, Michael, and John fly over London in the night sky, I decided to make a Neverland Smoothie Bowl. A smoothie bowl that incorporated the starry night sky, the second star to the right, and of course Peter Pan’s signature green color. 2 tablespoons of maple syrup, honey, or agave. 1. Blend your blackberries, blueberries, 1/2 your banana, your milk, ice, and sweetener together. You can optionally add a bit of coconut and flaxseeds if you desire. 2. Pour your smoothie into a bowl. 3. Slice your kiwi and put it on one half of your bowl (You want to be able to see your starry night sky). 4. With your remaining banana half, cut a couple of slices off (one larger one smaller). You can either using a knife cut them to look like stars, or use a cookie cutter. 5. Place your two banana slices on your bowl and a sprinkling of coconut. You’re all ready to enjoy your Disney-inspired smoothie bowl!